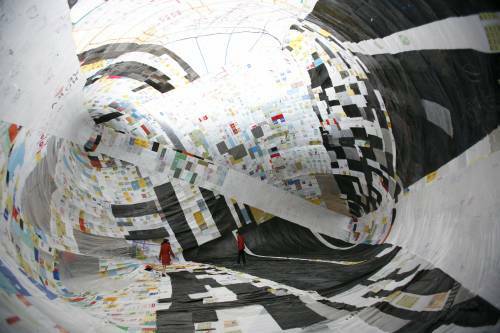 Last year around this time, Toms Saraceno visited the Twin Cities to install his sculpture Flying Garden/Air-Port-City/32SW in the group exhibition Brave New Worlds. During his stay in Minneapolis we talked about some of his interests-a huge range that includes the work of R. Buckminster Fuller, the 50th anniversary of the Sputnik launch by the Soviets, and his fascination, in general, with the sky. That’s when I learned about his project that brings together all of these interests. Museo aero solar is a flying museum’ powered by solar energy and made from huge quantities of used plastic bags that are taped together to create a massive balloon. Saraceno embarked on this project in 2006, during his visit to Isola Center for the Art in Milan (Italy), and the balloon keeps expanding – both in its scale (it is now the size of a basketball court) but also in the nature of its collection’ as it travels to different cities. In the past two years, Saraceno and his friend, the Italian writer Alberto Pesavento (who he met at Isola Center) have taken their flying museo to Sharjah (United Arab Emirates), Medelln (Colombia), Lyon (France), Rapperswil (Switzerland), Tirana (Albania) and most recently Ein Hawd (Israel). Now the Walker is hosting Museo aero solar‘s first visit to the U.S., from October 1-12, and I want to invite you to join us in this collective effort. Tell your friends and participate by bringing your collection of plastic bags–any size and color–to the Walker Art Center on Saturday, October 4 from 10 am to 3 pm and add your section to the Museo aero solar. If you can’t help on October 4, you can participate by donating old plastic bags in advance at drop-off bins stationed all around town: the Minneapolis College of Art and Design – 2501 Stevens Avenue, Minneapolis, the Green Institute – 2801 21st First Avenue South, Minneapolis, Rondo Community Outreach Library – 461 N. Dale Street Saint Paul, and Amazon Bookstore, 4755 Chicago Ave. South, Minneapolis. You can also participate in a series of open studio conversations that Saraceno and Pesavento will be having with students from the Aerospace Engineering and Mechanics (AEM) Department at the University of Minnesota and MCAD, please visit http://air.walkerart.org/index.wac or call 612.375.7550 for location and hours.